Vegetation is varied and made up of seasonally flooding grassland and various types of tropical forest. The wetland is bounded to the east, south and west by dense humid evergreen forest with Hills supporting semi-evergreen and deciduous forest. A substantial part of Nam Cat Tien floods which significantly affects the flora and fauna found the area. Afzelia xylocarpa (Fabaceae: Caesalpinioideae - a fine specimen in the Park is called 'Uncle Dong's tree', although the Vietnamese name normally translates as "red wood"). 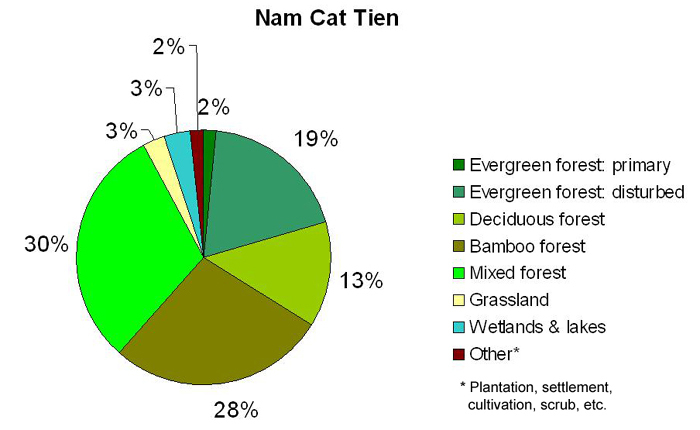 Sadly, <1% of the evergreen forest can be described as 'primary' in the whole Park (none in Cat Loc, but Nam Cat Tien has a higher proportion - see below); most has been partially logged or otherwise disturbed and re-establishment is difficult. Deciduous forest: trees with leaves that fall in dry season such as: Lagerstroemia spp. Including: L. calyculata & L. speciosa (banglang, Queen's crape-myrtle, banabá, pride of India: Lythraceae), Tetrameles nudiflora (thitpok in India, mengkundor in Malay: Datiscaceae), Anogeissus acuminata (Combretaceae). Mixed forest stands including bamboo: this includes secondary growth following slash and burn agriculture, logging, forest fires and wartime defoliation (i.e. aerial spraying of agent orange). With the forest canopy destroyed, bamboos (see below) and certain under-story trees become predominant including: Mesua sp. (Clusiaceae), Lagerstroemia calyculata (Lythraceae) Sindora siamensis and Xylia xylocarpa (Fabaceae: Mimosoideae). Predominantly bamboo: usually resulting from human activity as above. Forest that has been cleared then abandoned, may be completely replaced by bamboos, which normally only predominate in areas prone to flooding. Frequent bamboo (Poaceae) genera are: Bambusa (especially B. procera and B. balcoa) and Giagantochloa spp. Grassland: often as a result of previous cultivation (below). Although 'degraded', these zones can provide good viewing of mammals and birds. Flood plains, wetlands and lakes: Cat Tien National Park has large areas of swamp land, and unpolluted water resources. In the rainy season, the flooded area may exceed 2,500 ha - especially near the lakes (Bau Sau, Bau Chim and Bau Co). The area may also include relatively small (down to <1 ha) areas of forest swamp clearings in depressions of forest land: examples can be found along the ecological trail. Other land use includes: plantation (including cashew in the south of the park), settlement, cultivation (now greatly reduced), scrub, etc. De-forested land may become infested with alien invasive species. 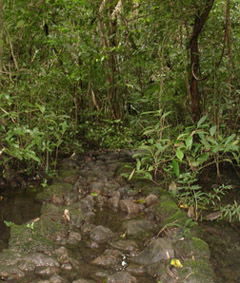 The pictures above show boulder pathways, made to help visitors traverse some of the wetter areas during the rainy season - the significance of which may not be apparent during the dry season (right) This picture also shows rattan, a vine-like palm [Arecaeae], trailing on the forest floor (to left of the picture). 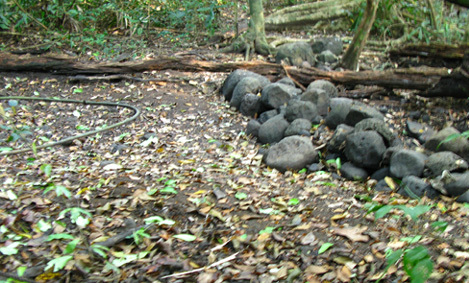 Tropical soils are often poor in plant nutrients and frequently acidic. The spectacular growth in a rain forest is largely supported by the efficiency of nutrient recycling after plants die and decay. Three groups of organisms: bacteria, fungi and arthropods are primarily responsible for this recycling, of which the latter two are most obvious. This photograph was taken during the rainy season, but termites often form characteristic galleries in which give them protection from predators and dry air. Their nests are frequently arboreal appearing as earth covered 'swellings' on tree trunks. Species in the genus Nasutitermes have "nasute" soldiers, with a head drawn to a point - from which they squirt a noxious sticky liquid if enemies attack. Unlike many other termite groups that have large jaws (mandibles), those of nasute termites are fused to the head capsule. The majority of this genus are associated with hardwoods, and may be timber pests in buildings. 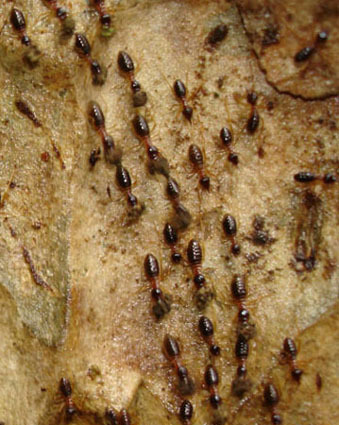 Identification from soldier caste with assistance from worker, nest habit and region of occurrence (species often having a strong geographical distribution). They can be distinguished from centipedes (which are usually carnivorous) by apparently having 2 pairs of legs per segment. Unlike centipedes they do not normally bite, but they may use a very unpleasant stink gland! Fungi occur in many forms, with a confusing array of names. Fungi are perhaps ultimately the most important decomposers of wood, leaves and other dead matter and many species are microscopic. They include mushrooms (implying that they are edible) and toadstools (some of which are deadly poisonous). 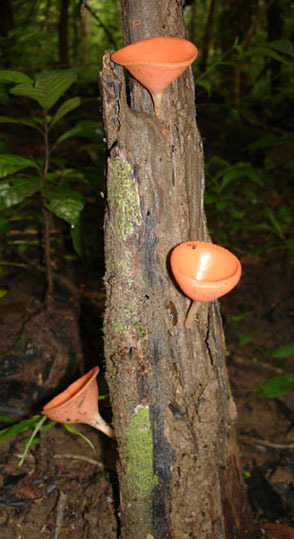 The attractive red cup-shaped fungus is Cookeina sp. 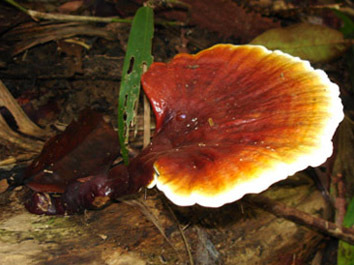 (order: Pezizales), which belongs to the Ascomycete phylum of fungi, is commonly found on forest paths during the rainy season. 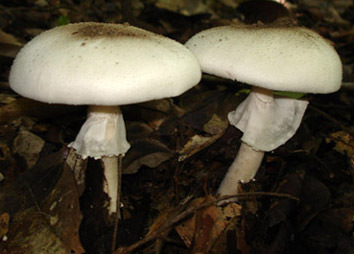 Many of the larger toadstool species belong to the Basidiomycetes; an Amanita sp. is shown here (top right) and the ubiquitous bracket fungi (Ganodermataceae), such as the Amauroderma sp. (below right), can be seen growing out of dead branches. 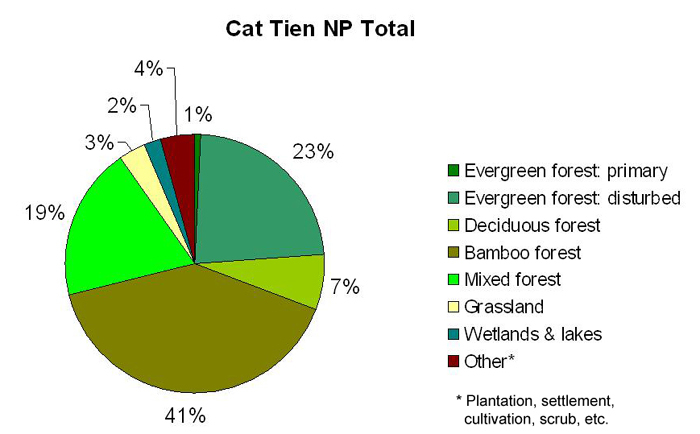 A forest such as Cat Tien almost certainly contains many thousands of species that are new to science - some of which might be economically useful. Examples include the entomopathogenic fungi, which can be used for pest control. 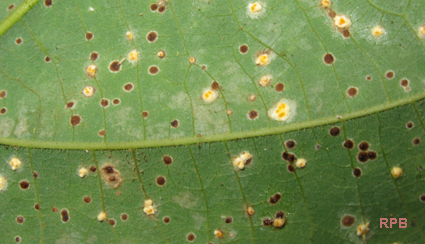 This picture shows Homopteran insects - probably whitefly nymphs (related to important agricultural pests) that have been killed with what is probably Hypocrella raciborski (ananmorph: Aschersonia placenta) - showing white/yellow fungal growth. There is also a more cryptic, unidentified pathogen forming chocolate-brown stromata (courtesy H. Evans). Dead animals don't escape the attention of ants for long! 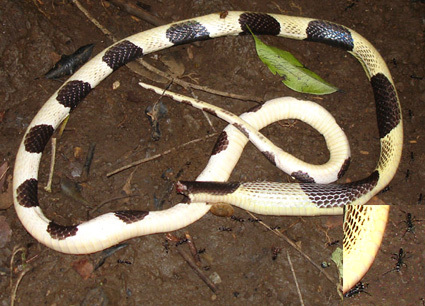 This recently dead krait (Bungarus sp. ), that was possibly killed by a mongoose has already attracted a trail of ants (detail bottom right) and a necrophagous fly (top centre).